Depends on how far the head is located relative to the bum I spose. Well, this week was spent thinking. Seem to do a lot of that when attacking the salt again. I'm sure ever salt racer would agree, we spend more time thinking and planning the project than actually working on it. Too much time to think. Thoughts this week have concentrated on radiator position and scoop design. When we built the Effie there was no rule on radiator position. Taking this grey area I fitted an ex Supercar radiator (quite short) as low as possible then built an airbox to pickup from above the radiator. A win/win. No scoop through the bonnet. Well, the rule changed to specify "Radiator mounted at stock height and position". Nothing grey there anymore. I think our only possible choice to achieve positive airbox pressure will be to poke a scoop though the bonnet. Ok that was this week. Solved a problem, made a decision. Tick. Does it mention the bottom of the radiator being in the stock position? Could you lift the rad to the original height but use the short rad and bring the air in underneath? Thought of that too Dave, no can do. Also the air intake height can't be lower than the original pickup point. No other stock holes high in the rad support panel that would suit. I don't wont to use cowl induction as I cant be convinced it will create positive pressure. I have used rearward facing bonnet scoops on road cars successfully. No actual numbers other than a HJ with 253 5 speed rearward facing scoop would loose about 15kph top speed when I took the sealing ring between the bonnet and the air cleaner housing off. Had a Carter Thermoquad (XD Cleveland) and Cleveland air cleaner housing with the original inlet hole blocked off and the lid cut at the diameter of the air cleaner element. 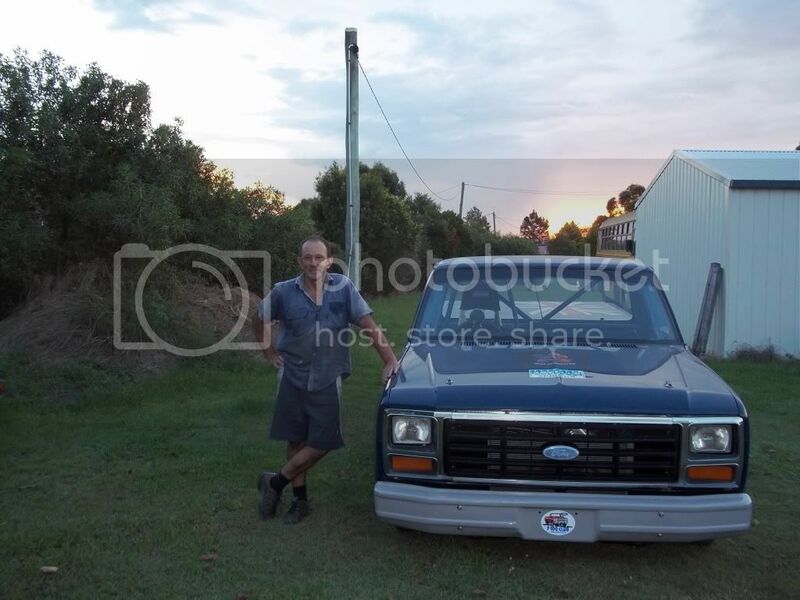 Why Ford stuff on a Holden?, XD ute was my toy at the time, HJ family car. Carter Thermoquads greatly underrated IMHO. Had cowl induction on the XD, never did back to back runs as it was a pig to pull the connecting hoses off. Not working on my liner at the moment, distracted by a longer slower ride. Bored at a rest day in Coober Pedy. Could tune a thermoquad on a dyno almost as well as any efi system if you spend enough time. Ran cowl induction on the XP ute and the incar clearly shows. https://www.youtube.com/watch?v=cl7QZTncQXc the top of the scoop being sucked down . I cannot be convinced they create + pressure. Bob Ellis dropped around yesterday morn to give Bridgee and I a run through on what we had to do to run Bonneville. Well bottom line, need some changes to the cage we weren't planning but, so be it. Our tube wall thickness was a bit under. Need to shift the battery cut off to the rear panel. Vent the battery box and isolate it from the fuel cell. Change chute mounting. I want to fit the full containment seat and shift it closer to the centre. Shift column across to match. Redesign the window net from scratch so it is compact, easy to use and effective. I'm guessing this part alone will be time consuming to get right. Change throttle cable to a morse type. This plus the major rework to lower suspension, reposition the engine and trans etc etc. Going to get real busy soon. Pete, the F Truck runs in production. She runs different size Windsors. Cage removed last week and nutted out shape for new one including funny car style drivers surrounds. We are shifting the driver inboard a bit to make more clearance from the window net. Next will be the major lowering job, adjustable front struts and heavier rear springs. Ok, this is the old F Truck. New one will be lower. So why is this photo thing so bloody impossible. Put the pic in photo bucket. Click the URL thing above. Copy your pic then post in between the . What have I done wrong. The previous post ends up with a link not a pic. In Photo bucket on the right side "Share Links" bottom line "IMG" left click it, it says "copied" Right click in ya post and paste. I Think thats how I did it.